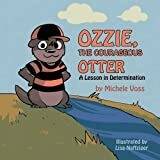 “Ozzie, the Courageous Otter” is the delightful story of a young otter who is afraid to slide down a slope into the river with friends. He gets tired of watching them have all the fun and becomes determined to overcome his fear. Using rhyme and whimsical characters, the author hopes this book will be a useful tool for parents and teachers alike to introduce the values of courage and determination to young children.